GROUND ZERO PLUS 1234 DAY--New York, NY, Friday, January 28, 2005--On January 20, 2005, President George W. Bush gave a speech to the world that left most listeners stunned and dazed. The implication of his 2020 words was that America was on a quest to end tyranny abroad single handedly. His adumbrations stiffened hackles on the necks of most national leaders. His inference was that America would decide "who was a tyrant" and act unilaterally to replace tyranny with freedom. 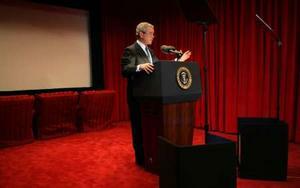 President Bush. has tempered his tone recently, based on a barrage of critics both at home and abroad who consider his commentary a challenge to the world to do it "America's way" or suffer the "consequences." Even his father, former President Herbert Walker Bush, made a highly unusual visit to the White House press room this past Sunday to emphasize that his son's comments did not mean "new aggression or newly asserted military forces." There is little question that President George W. Bush is on a mission to rid the world of Terrorism. 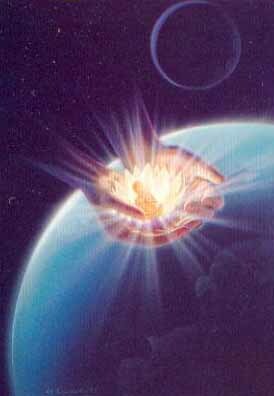 The world, however, fears that the mission itself might be one filled with that which is being sought to be eliminated. What President Bush missed in framing the words he delivered on January 20, was a clear and defined universal connection between the United States and the global community in relation to the "war on terrorism." He missed the opportunity to rally the world behind a worthy cause, a necessary crusade to free the children and their children from Terrorism's greatest threat--Complacency. His primary err in delivering the speech was the assumption that tyranny and oppression--Terrorism--can be eliminated. But, it can be contained. This flaw revealed a giant crack in the President's rational armor and exposed a crevice of deep egotism. Intoxicated by the 2,000 gallons of American blood spilled in Iraq, he presented himself as the sole and lonely Sentinel of Global Vigilance. The echo of isolationism bounced from constant repetitions of the words "freedom" and "liberty," bludgeoning the listener pedantically as one might employ a club upon the heads of dolts. Had he stepped back and examined Terrorism not from a political or "national leadership" viewpoint, and, seen it from a parent's point-of-view, he would have realized that fighting Terrorism is a team effort not an individual one, and while the spark necessary to ignite the team into action may be the action of one parent, the perpetuation of that battle requires a unanimity of parental obligation and duty that is both ageless and instinctive. His call to action would not be to vow or pledge more American blood, but to demand the duty and responsibility of all nations to spill theirs if necessary to protect the safety and security of the children and the children's children's children of all nations. The first step in building a Global Parents of Vigilance offense against Terrorism would have been a call for each of the 100 million head-of-households in America to personally vow to fight Terrorism at the front door, in their own homes, neighborhoods, at the workplace, in the community. That battle would not be limited to simply searching for Osama bin Laden types, but to help reduce and eradicate the prejudice, bigotry, marginalization, segregation, isolation, elevation and declination of human values within each home and community. He would have called for the "seeds of Terrorism"--Fear, Intimidation and Complacency--to be dug up first at home and cast into the sea, replaced by the Principles of Vigilance--Courage, Conviction and Right Actions that benefit the Children's Children's Children. Then he would have asked the global community to join hands, not as nations bridging cultural and political gaps, but as parents, grandparents, uncles, aunts, cousins, nephews and nieces in support of protecting the children and their future generations from threats of tyranny and oppression upon which Terrorism feeds. He would have taken a personal Vow of Vigilance before the world, and asked all fathers and mothers, grandparents, relatives and loved ones to join in becoming Global Citizens of Vigilance. There is little doubt that America has served as a role model for a Nation of Vigilance for nearly a century. It has struggled to fight its own Internal Terrorism, and, for the most part, has been successful. It stands as a superb illustration of how a Nation of Vigilance can be formed and sustain itself. But, it cannot stand alone for long. That's why President Bush needed to call on each of the six billion citizens and some 200 nations throughout the world to be Parents of Vigilance, Citizens of Vigilance, Loved Ones of Vigilance, Grandparents of Vigilance. In fact, his speech had little to say about the children. There was some eluding to them in the term "future generations" but nothing to anchor a political grappling hook. Had he gone to the hearts and souls of the world, and asked them to join a Global Vigilance Team, led not by nations but by citizens, armed to fight Terrorism not in the bloody battlefields of war but also at the doorsteps of each neighborhood, he might well have rocked the world with his insight. Below is an edited copy of his speech. I've taken the liberty to revise it as I would have suggested he deliver it. I also believe that in his heart, President Bush is a Father of Vigilance who supports the importance of a Global Community of Vigilance and not just one championed by America. I believe he simply forgot to say what he really meant from a father's and grandfather's viewpoint. I invite you to read my revisions (in red) and to ponder the President's speech as though it had contained a continuation of my revisions. 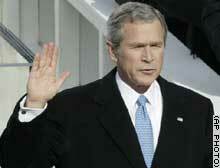 I consider my revisions a matter of "adding to" and "building upon" what President Bush said on January 20, 2005. I believe the key to the revisions is his calling upon all the world to take a Pledge of Global Vigilance and to be willing to stand up to Terrorism's Fear, Intimidation and Complacency despite all those who defer it to others. You may not agree with all the words I've revised, but you cannot disagree with the message--that only when we, as a world of concerned Parents, Grandparents, Citizens and Loved Ones of Vigilance, stand up to Terrorism, will the threat of its perpetuation shrink. Read my revisions and think about them. Then write your own "State of the Union" speech and focus on your beliefs and commitments to fighting Terrorism. When you're finished, take the Pledge of Vigilance. Then pass it on to others. When you do, listen for the earth to quake. It will. For each person who becomes a Sentinel of Vigilance makes the Beast of Terror shudder just a little more. At this second gathering, our duties are defined not by the words I use, but by the history we have seen together. For a half a century, America defended our own freedom by standing watch on distant borders. We assumed the role of Sentinel of Vigilance abroad to not only help those who suffer from tyranny and oppression in distant lands escape the bonds of Terrorism, but by so doing, we strengthened the durability of our own protective walls. Our willingness to serve as Sentinels of Vigilance against global Terrorists is evidenced in the freedom of 49 million people in South Korea, 126 million in Japan and 455 million in Europe, to name but a few. Not every effort to secure the freedom we enjoy has been accomplished. In Vietnam, we offered more than 57,000 American lives whose blood was spilled in search of freeing that nation’s 78 million citizens. One day, democracy will reign where communism now gasps it last breath. The victory of freedom in Vietnam has only been delayed, not forever lost. We have seen our vulnerability and we have seen its deepest source. For as long as whole regions of the world simmer in resentment and tyranny — prone to ideologies that feed hatred and excuse murder — violence will gather, and multiply in destructive power, and cross the most defended borders, and raise a mortal threat. There is only one force of history that can break the reign of hatred and resentment, and expose the pretensions of tyrants, and reward the hopes of the decent and tolerant, and that is the force of human freedom. And that human freedom cannot be protected by any one nation, or extolled by any one national leader. Human freedom is an inalienable right, granted by a divine source to every child upon birth. It is not subject to the whims of tyrants who consider themselves hammers and all others nails. Each individual carries in his or genes the duty and responsibility to be a Sentinel of Vigilance for the sake of future generations. Only when the parents, grandparents, uncles, cousins, aunts and loved ones of the children in all 200 nations are willing to stand up and battle the looming hand of Terrorism can the world hope to eliminate the threat of terrorism. Terrorism is a bully who feeds on fear and intimidation. He runs when people show courage, conviction and focus on right actions that provide security and prosperity for the children’s children’s children. We are led, by events and common sense, to one conclusion: The survival of liberty in our land increasingly depends on the success of liberty in other lands. The best hope for peace in our world is the expansion of freedom in all the world. That freedom isn’t ours to give, for it is inherent in all. But, as Sentinels of Vigilance, we stand ready to support the removal of any shadow of Terrorism that endangers the children’s freedom in any land with the same fervor we do our own. America's vital interests and our deepest beliefs are now one. From the day of our founding, we have proclaimed that every man and woman on this earth has rights, and dignity, and matchless value, because the rights of man and woman, as Thomas Paine so aptly underscored, come from a divine source, one of a higher authority than any human being. they bear the image of the maker of heaven and earth. Across the generations, we have proclaimed the imperative of self-government, because no one is fit to be a master, and no one deserves to be a slave. The price of self-government is generational vigilance. It requires our willingness to not become complacent about our own freedom, or to accept the bonds of tyranny, but to look beyond our own selves to the future of the children and their children, and act in accordance with the role as Parents, Grandparents, Citizens and Loved Ones of Vigilance. This means facing the Beast of Terror when he exposes his fangs, and crippling him before he sinks them into the innocent flesh of our young. Advancing these ideals is the mission that created our nation. It is the honorable achievement of our fathers. Now it is the urgent requirement of our nation's security, and the calling of our time. So it is the policy of the United States to seek and support the growth of democratic movements and institutions in every nation and culture, with the ultimate goal of ending tyranny in our world. But this quest is neither singular nor novel to this administration, or to any nation savoring the fruits of freedom. All free nations know that world stability from an economic and social plateau is contingent upon a world free of tyranny and oppression. The recent formation of the European Economic Union is one example of the binding of parts into a synergistic whole. National alliances for prosperity are based in mutual respect for the freedom of every citizen. The roots of democracy stretch to Rome and Switzerland. If America is standing up to Terrorism, it is standing no taller than any nation that respects liberty and is willing to preserve it with the blood of their citizens at home and abroad. Vigilance This is not primarily the task of arms, though we will defend ourselves and our friends by force of arms when necessary. Freedom, by its nature, must be chosen, and defended by citizens of Vigilance—grandparents, parents, cousins, uncles, aunts, brothers, sisters--and sustained by the rule of law and the protection of minorities. And when the soul of a nation finally speaks, the institutions that arise may reflect customs and traditions very different from our own. America will not impose our own style of government on the unwilling, for if we made such an attempt we would become the Terrorists we seek, in unity with the world, to render harmless. Further, freedom can be expressed in a multitude of ways, as evidenced by America’s melting pot culture. Our goal instead is to help others find their own voice, attain their own freedom, and make their own way in behalf of their children, and their children’s children. If we stand up to the task, it is only for the freedom of future generations that we invest our blood in far-off lands. We know today there are grandchildren, great grandchildren, and even great great grandchildren in Europe, Japan and South Korea living rich lives of freedom because America, with other allies, was willing to be a Sentinel of Global Vigilance. The great objective of ending tyranny is the concentrated work of generations. The difficulty of the task is no excuse for avoiding it. America's influence is not unlimited, but fortunately for the oppressed, America's influence is considerable, and we will use it confidently in freedom's cause. What parent would pass by a home where inside the sounds of a child being abused rang upon the ears of those passing by? If we are Parents of Global Vigilance, none of us as citizens of a world can stand by and let oppression and abuse destroy a child’s divine right to live in the sunlight of prosperity rather than the darkness of tyranny. My most solemn duty as a Father and Leader of Vigilance is to protect this nation and its people from further attacks and emerging threats. Some have unwisely chosen to test America's resolve, and have found it firm. America has not avoided drawing its Sword of Vigilance against those who threaten our children and take the lives of their parents, grandparents, and loved ones in merciless acts of tyranny. We will persistently clarify the choice of Vigilance versus Tyranny before every ruler and every nation: The moral choice between oppression, which is a violation of the natural “rights of all” always wrong, and freedom, which is eternally right. America will not pretend that jailed dissidents prefer their chains, or that women welcome humiliation and servitude, or that any human being aspires to live at the mercy of bullies. We know also that all nations that subscribe to the respect for human dignity and its inherent freedom support the same belief. We are not standing above any nation in this respect, but, rather, alongside all. We will encourage reform in other governments by making clear that success in our relations will require the decent treatment of their own people. This is the same accord any parent would seek from another parent who was neglecting or endangering the freedom and prosperity of his her children. America's belief in human dignity will guide our policies, yet rights must be more than the grudging concessions of dictators; they are secured by free dissent and the participation of the governed. In the long run, there is no justice without freedom, and there can be no human rights without human liberty. As part of the Global Sentinel of Vigilance team, we will urge all nations who run roughshod over fundamental freedoms to expedite the removal of policies and practices that smother individual liberty. We understand that an inch in this direction is a mile, and seek to see progress rather than perfection. Some, I know, have questioned the global appeal of liberty though this time in history, four decades defined by the swiftest advance of freedom ever seen, is an odd time for doubt. Americans, of all people, should never be surprised by the power of our ideals. Since the dawn of time,Eventually, the call of freedom germinates in comes to every mind and every soul. We do not accept the existence of permanent tyranny because to do so would imply the existence of we do not accept the possibility of permanent slavery. Liberty will come to those who love it. All who live in the shadow of tyranny and hopelessness can know: The United States will not ignore your oppression, or excuse your oppressors. When you stand for your liberty, we will stand with you. When you become Sentinels of Vigilance for your children, we will march with you, and, while we cannot speak for the other free nations conclusively, we know that if you are fighting for the rights of your children, they will also be stirred to join in your struggle. Only when the world is unified in Vigilance can the Demons of Tyranny be contained. This is not the task of any one nation, but requires the backbone of a global community that cares more for the rights of their children and their children’s children than their own immediate satisfaction. It is easy to pass by a home where a child is being abused inside and say: “It’s none of my business. I’m not getting involved.” But it is hard when that abuser starts beating on your child, or the child of the abuser becomes an abuser and lashes out with anger and hatred against those who sanctioned his abuse. Democratic reformers facing repression, prison, or exile can know: America sees you for who you are: The future Parents of Vigilance, examples of people willing to risk their lives in behalf of future generations.leaders of your free country. Today, January 20, 2005, is the dawn of the Era of Vigilance. While Terrorism burst through the door at the launching of the millennium, Vigilance has awakened in all citizens as never before. The world today is threatened not as individual nations, but as a community. One crazed Terrorist cell seeking revenge against the world can unleash deadly toxins that know no borders, recognize no ethnicity or cultural lines and kill, maim and endanger the genetic chemistry of all children. America is standing up to the Global Call of Vigilance, it is not creating it. While many may wish to rebuke our actions, they are not taken in behalf of America as much as for all nations and all peoples. We know that Terrorism by its nature is human cancer, and, unless carved out, will eat its host. We also know our children and the children of all nations are one. The children do not have differences. They are the pure innocence of humanity, true citizens of the world. We will fight tyranny and oppression for them, as we would expect any Parent of Vigilance to stand up for the rights of the children. For that reason, I call upon you today to join me in a Global Pledge of Vigilance. 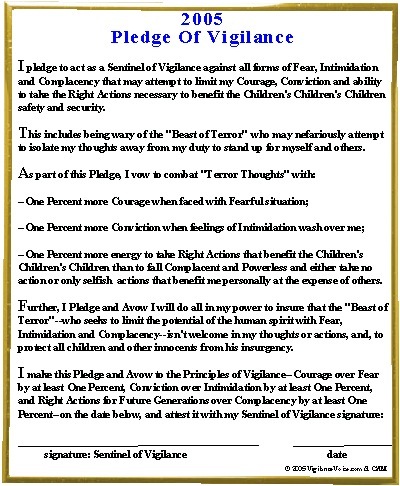 I ask you to vow to fight the Beast of Terror with the Principles of Vigilance, and to tear down cultural, religious, national, economic, social differences that cleave adults and consider only the children, and the children’s children in taking the Pledge. This is not an American Pledge, it is a Global Pledge, one we cannot afford to neglect. Join me know in a commitment to putting Terrorism on perpetual notice that we are all Parents and Citizens of Vigilance. In America's ideal of freedom, citizens find the dignity and security of economic independence, instead of laboring on the edge of subsistence. This is the broader definition of liberty that motivated the Homestead Act, the Social Security Act, and the G.I. Bill of Rights. And now we will extend this vision by reforming great institutions to serve the needs of our time. To give every American a stake in the promise and future of our country, we will bring the highest standards to our schools, and build an ownership society. We will widen the ownership of homes and businesses, retirement savings and health insurance preparing our people for the challenges of life in a free society. By making every citizen an agent of his or her own destiny, we will give our fellow Americans greater freedom from want and fear, and make our society more prosperous and just and equal. In Americas ideal of freedom, the public interest depends on private character on integrity, and tolerance toward others, and the rule of conscience in our own lives. Self-government relies, in the end, on the governing of the self. That edifice of character is built in families, supported by communities with standards, and sustained in our national life by the truths of Sinai, the Sermon on the Mount, the words of the Koran, and the varied faiths of our people. Americans move forward in every generation by reaffirming all that is good and true that came before ideals of justice and conduct that are the same yesterday, today, and forever. We go forward with complete confidence in the eventual triumph of freedom. Not because history runs on the wheels of inevitability; it is human choices that move events. Not because we consider ourselves a chosen nation; God moves and chooses as He wills. We have confidence because freedom is the permanent hope of mankind, the hunger in dark places, the longing of the soul. When our Founders declared a new order of the ages; when soldiers died in wave upon wave for a union based on liberty; when citizens marched in peaceful outrage under the banner "Freedom Now" they were acting on an ancient hope that is meant to be fulfilled. History has an ebb and flow of justice, but history also has a visible direction, set by liberty and the author of Liberty. Go To January 25 Story: "All Quiet On The Terror Front"